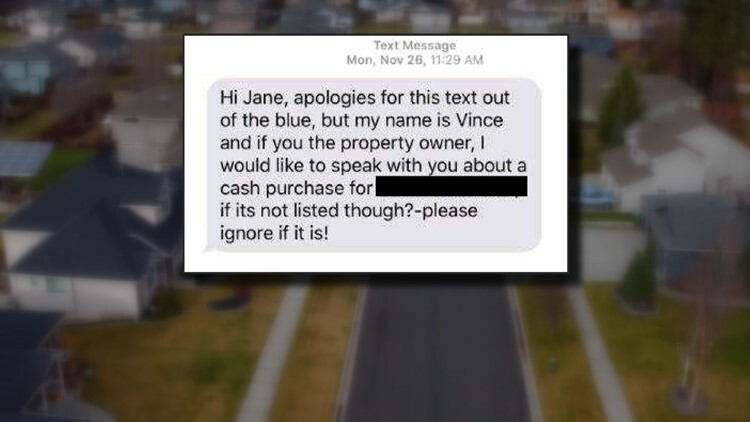 SPOKANE, Wash. — A number of people in the Spokane area have gotten a text message asking to buy to their house and turns out it is from a legitimate business. The random text had some wondering if it was some type of scam. This week two KREM employees got a text message from a person named Vince. He asked if he could buy their house with cash. It seemed a bit odd so KREM posted the text on its Facebook page to see if others had gotten similar texts. Within hours the post had dozens of comments. Some mentioned they got a text from someone named Stacy. A majority of the people commenting thought it was a scam. But a post by Precision Property Buyers put the speculation to rest. The Spokane-based company said they were the ones texting people. The company buys houses and then sells or rents them out. It is an accredited business. They have an A+ rating from the Better Business Bureau. Nathan Price of Precision Property Buyers said they use public records to get home addresses and they use a service to get access to phone numbers. He said he does not blame people for thinking it is a scam. And he knows it is unconventional to text people. He said this is just one way they try to connect with property owners.